Q: What is Second Career all about? A: This is a fairly new (started on 1-June-2008) Government sponsored program allowing those of us who qualify to upgrade our skills in order to get new jobs. Q: How long would it take to be re-trained? A: Anywhere from 6 months to 2 years, and possibly one additional year if you need to upgrade to grade 12. For courses of up to 4 months, alternative program, called Skills Development, exists. Q: Where can I find more information on the programs and colleges? A: For public colleges click here, and then select Find. On the page that opens you will be able to filter the programs by College, start date, program category etc. For private colleges click here, and then search by program area (category) or type in the name of the college. Q: What if I already accepted a low-paid job, do I still qualify for Second Career training? A: You may still qualify, if the job you accepted has a lower wage and/or a lower skill level compared to the original layoff job and if you obtain an Authorization to Quit from MTCU. Q: What are the steps to be approved? A: First you need to meet with the Career Adviser. Call our Action Centre (905-532-0633) to book an appointment. OPEN HOUSE on Thursday October 16th from 12:30 PM till 3:00PM. Official Opening Ceremony is scheduled to commence at 1:15PM, with some special guests. Free lunch and entertainment for everyone! In recognition of our efforts through past two months all ex-PMP workers have been invited to lead Labour Day Parade! On Monday 1st-Sep-2008 at 9AM, Labour Day Parade will leave from Queen & University intersection in downtown Toronto. All ex-PMP workers are invited to join with their families. The parade will end around 11AM at CNE, where free entrance to National Exhibition will be granted to everyone wearing a wrist band from the parade. Starting in September the new Action Center will open its doors for all ex-PMP employees and their families. The Center is going to be run by ex-PMP employees volonteering as Peer Helpers. The center will most likely be located at 2180 Steels Ave W, unit #3, which is at north east corner of Steels & Keele. Whoever is willing to help run the center is welcome to join . The next training session for Peer Helpers will be conducted in September, after the Center opens its doors. Have you filed Severance Claim Yet? The claim should be for 16 weeks Termination Pay, regardless of how long you've worked for PMP, as rules for 'Mass Termination' apply. The process of filing this claim may take you up to half an hour. There is no guarantee that there will be any money coming out of this, but some chance exists. And be prepared to wait for 6 months or more, until this claim gets to the attention of Government authorities. Apply for Unemployment NOW !!! The conclusion from information session held by government representatives yesterday was that there is no reason to wait with application for Employment Insurance Benefits (i.e. Unemployment). 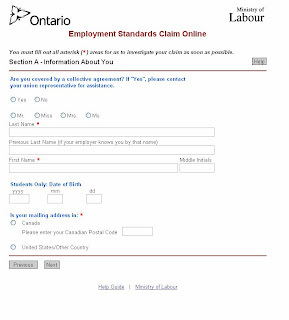 Application should be filed on-line and as soon as possible regardless of weather or not you have already received your Record of Employment or weather or not there will be any severance pay issued to you in the future. And if you haven't received your Record of Employment yet, you may want to check your mailbox again, they've been mailed out! If you have energy and interest in changing your career you may want to explore this Ministry of Training, Colleges and Universities web-site offering information on Career Change.